Egypt’s Muslim Brotherhood leader Mohammed Badie has appeared in court for the first time since his arrest in August. 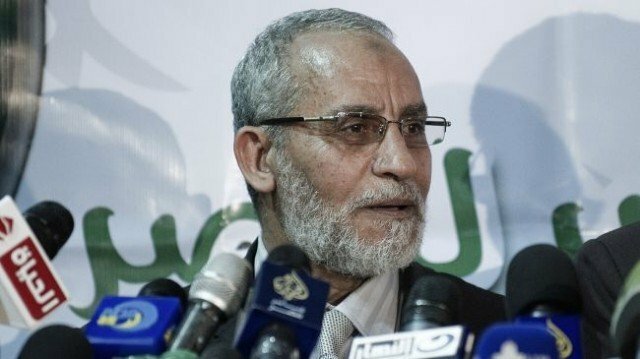 Mohammed Badie was seized along with other Brotherhood figures after the Egyptian army ousted Islamist President Mohamed Morsi in July. Hundreds of Mohamed Morsi’s supporters were killed in clashes following the ousting. Mohammed Badie, who is the movement’s General Guide, denied the Brotherhood had acted violently. He is facing charges of inciting violence and murder over the deaths of eight anti-Brotherhood protesters outside the movement’s headquarters in Cairo. Mohammed Badie was in court in Cairo along with other Brotherhood figures. He asked why the death of his son and the burning down of Brotherhood offices were not being investigated instead. Mohammed Badie was a prominent figure at the Brotherhood’s protest camps in Cairo, but went into hiding as the military-backed interim government increased its efforts to shut down the protests. His 38-year-old son Ammar was killed in the protests. In a separate case, Egyptian prosecutors referred the secular activist Alaa Abdel Fattah and 24 others for trial. They are accused of breaking Egypt’s new laws against protests by demonstrating without permission last month.